Jeremiah tries so hard to care. Pop-Pop once took him fishing and told him ghost stories and taught him all the good swear words when Jeremiah’s mother wasn’t listening. But that Pop-Pop is rarely at home when Jeremiah looks into his grandfather’s eyes. He mourns for him and digs deep for a patience beyond his years through dinner time, bath time, bedtime and an ear always cocked, listening for the sound of a door opening or the stove turning on. Most of the time he finds what he needs to be the grandson, the son, the man his family needs him to be. But other times he slips some sleep-aid into Pop-Pop’s macaroni-and-cheese so Jeremiah can just breathe for a few moments. Moments he deserves. What he has to steal, his peers take for granted and sometimes he has to just go in the backyard and shout Pop-Pop’s swear words at the top of his lungs. Fifteen years old, and Jeremiah has found himself playing parent to an old man who wears the face of his Pop-Pop, but is so often a stranger. School by day, Pop-Pop by night. It is what it is. And he hates it. It is one of these nights when Pop-Pop is in a deep macaroni-and-cheese slumber that Jeremiah sits on his front porch and tries to enjoy the relief anchored with guilt. Crickets chirp and the air is thick with the stench from the dog food factory just outside of town. If Jeremiah doesn’t breathe too deeply, he can kinda, sorta believe the evening is pleasant, and he’s just chillin’ like any other teenage boy on a Friday night might be. He closes his eyes and pretends he has all night. When he opens them, the Cecily Cooper is walking down the sidewalk in front of his house. She became the Cecily Cooper when she dared to show up to high school with a body that made it impossible to concentrate on geometry or constitutional rights. Then came the rumors about what that body was good for. Standing in front of Jeremiah’s house, Cecily Cooper is clothed just enough to not to be labeled indecent by furrow-browed adults who don’t know what today’s youth are coming to. Low-rise shorts, hipbones like handles peeking above her waistband. Midrift bare, that shiny silver loop through her bellybutton sending secret messages to Jeremiah so he can think of nothing but running his tongue over it, swirling it around her innie. But when she smiles at him, it feels sad, and he remembers when Cecily Cooper used to be CeeCee who was always up for riding bikes to the bluegill pond on a hot summer afternoon. CeeCee who helped him build a secret fort when they were ten and had some creative ways of using all those swear words Pop-Pop taught him so long ago. Looking at her now, CeeCee seems as lost as Pop-Pop, and Jeremiah is suddenly choking on nothing. “Hey, Cecily,” he manages to say. The first words he’s uttered to her in two years, he’s pretty sure. “Hey, Jer,” she says back, momentarily looking over her shoulder as if she’s not entirely sure his greeting is directed at her. “I’ll take you,” Jeremiah says out of nowhere. He doesn’t know why he says this. He knows he can’t leave Pop-Pop, even if he will probably sleep for hours yet. “Can you?” Cecily asks and he feels his face burn. She knows. Everyone knows. The Ferris wheel lurches to a stop in front of the suicide hotline billboard, full moon basking down on Jeremiah and Cecily Cooper. Once around and he’ll go back home again. That was the deal. Her thigh presses into his, and he feels there should be a million questions he can ask her, but silence clots around them. The wind rocks the basket of the Ferris wheel gently back and and forth and lifts Cecily’s strawberry curls to caress Jeremiah’s cheek. He closes his eyes and releases a soft sigh, feeling he has somehow ascended to heaven. His real life is so far below him, it doesn’t seem possible that he will have to return to it at all, let alone in less than an hour. With that thought, heaven vanishes. Even now he worries his mother is calling to check in from her shift at the hospital. What will happen if he’s not there to pick up? He clenches fists in his lap and wants to punch something. But all that is in front of him is the billboard, out of reach and utterly useless. Cecily begins to hum softly next to him. Jeremiah clears his throat. He locks his gaze on the billboard looming in front of them and thinks that maybe just flinging himself over the edge is the only way to relieve the pressure of this moment. Then, Cecily’s hand begins a pilgrimage — his knee, his thigh, higher, higher. Never looking at each other, both gazes firmly locked on the idiotically redundant: NEED HELP? 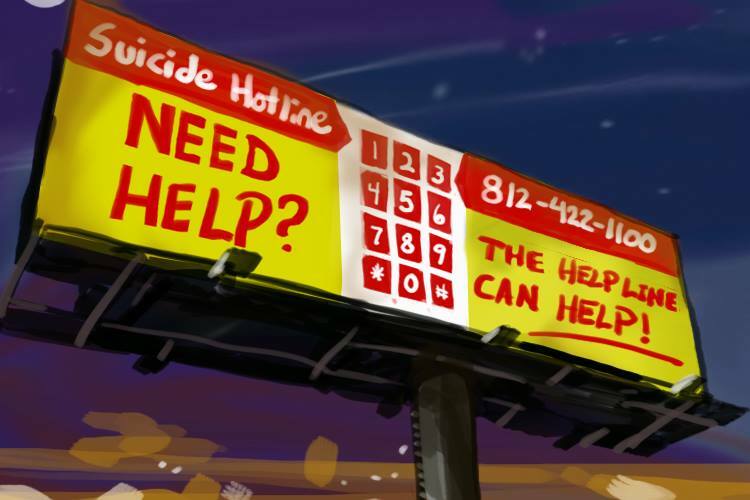 THE HELPLINE CAN HELP. Sweet treasure, her hand finds paradise. With a newfound sanctity, Jeremiah prays that the Ferris wheel will remain stagnant, resist that stagger forward for just a few precious breaths more, letting them both remain suspended indefinitely in that beautiful, perfect moment. Then he hears her breath catch, and Jeremiah turns to see the beautiful girl beside him, tears running mascara trails down her cheeks. And he knows they are both lost lambs just trying to find their way home again. Diane D. Gillette lives in Chicago, IL with the love of her life and their two demanding cats. She’s a teacher in the habit of collecting graduate degrees and is one of the founding editors of Cat on a Leash Review. 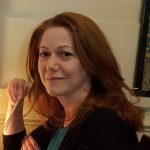 She’s seen her work published in various journals including The Maine Review, Dual Coast Magazine, and Burningwood Literary Journal. You can find more of her published work at www.digillette.com.